A pager, or beeper, is a small, battery-powered device that alerts the person carrying it when someone is trying to reach them by telephone. The beeper utilizes electronic components sensitive to an FM radio signal and will beep or otherwise sound, flash, or vibrate to alert its carrier. Originally only used by doctors and certain businesspersons to notify them of an urgent call, beepers have become more common in the last two decades. By 1992, an estimated 2.9 million people in the U.S. alone carried beepers, and the number of users worldwide was much larger. The first radio paging device was used in the New York City area in 1950. Two decades after its introduction, there were approximately 32,600 pagers in use. The pagers manufactured during this early era were often large and somewhat unreliable. Technology led to improvements in electronic circuitry, and small, more reliable pagers came on the market around 1972. During the next decade, the devices became more popular as the price came down. By 1981, there were an estimated one million users in the U.S. Originally, pagers could receive a radio signal only in a specific geographic area. A caller in New York City, for example, might have a difficult time paging someone in Boston. Today, several pager companies offer the ability to page people across country, and worldwide paging is on the horizon. The typical beeper contains an FM receiver, a tone-decoding device, and an audio amplifier. When alerted, the carrier can access the telephone number of the person trying to reach him or her. More complex beepers have alphanumeric capability and are able to display names of and messages from callers. The industry is also developing small, hand-held devices that are much more sophisticated versions of the simple beeper. The basic design of pagers has changed very little since they were introduced, but advances in electronic components and circuitry have significantly reduced the size and weight of the overall package. of the phone from which he or she is calling. In operation, a typical pager works as follows. Each pager is assigned an individual telephone number and a specific radio frequency on which it can receive signals. When someone dials the beeper telephone number, the telephone call is routed through the telephone lines to the paging service office. At the paging service, a controller device checks its memory for the radio frequency assigned to the beeper being called, then activates a radio transmitter to broad-cast a short signal on that frequency. These frequencies are within the VHF (very high frequency) or UHF (ultra high frequency) FM radio bands. Within the beeper, there is a receiver circuit and a decoder circuit. The receiver circuit receives the signal, separates it from other signals, amplifies it, and passes it on to the decoder. The decoder verifies that the number dialed matches its own unique, programmed telephone number, then activates the beeper or other alert circuit. The decoder also processes the second part of the signal, which contains the telephone number or message of the person calling. A basic pager simply displays this telephone number on a small display screen. More sophisticated pagers can display the number and a short message. Some pagers have voice capability and can give a ten-second voice message that the caller has made. Materials used in the manufacture of pagers range from metals to ceramics, paper, rubber, and plastics. The outer housing of the pager is usually made of a resilient, high-impact plastic. It is made at the plant by injection molding machines. The shells are usually black, but marketing efforts to attract younger users have produced brightly colored ones as well. The entire beeper unit, including the battery, generally weighs only few ounces. The basic design of pagers has changed very little since they were introduced, but advances in electronic components and circuitry have significantly reduced the size and weight of the overall package. The addition of numerous options to the basic pager function has increased the complexity of the circuits. Some of these options include voice message capability and the ability to transmit short messages from the pager back to the calling party. The typical manufacturing process for pagers involves two distinct steps. These steps are known as the "front end process" and the "back end process." Both processes utilize computer integrated manufacturing, or CIM. CIM is a network of physical hardware linked with computers using special software, or programs. CIM is designed to assist the production operators in tracking each stage of the manufacturing process and ensuring that the pager is built with the proper components and options specified by the customer. 1 A group, or array, of one or more receiver or decoder printed circuit boards is run through a machine called a solder printer. Printed circuit boards (PCB) are thin, stiff pieces of electrically non-conducting material onto which a pattern of electrically-conducting material has been bonded to form numerous circuit paths, much like flat wires. Electronic components are attached to both sides of the board and interconnected by the printed circuitry. The solder printer is programmed to apply a small amount of solder paste to the points where the components will make electrical contact with the printed circuits. 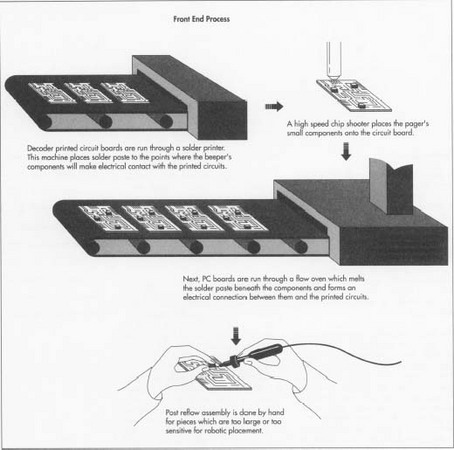 2 The PCBs are then processed through another machine known as a high-speed chip shooter. The shooter quickly and accurately places, or shoots, the majority of the pager's small components onto each board. 3 After a visual inspection, the PCBs are run through a series of robotic placement machines which place the larger and odd-shaped parts onto the boards. These include the integrated circuit (IC) chips, oscillators, and crystal filters. 4 Once all these parts have been placed, the boards are run through a reflow oven. In this oven, the solder paste melts, or reflows, to form an electrical connection between the components and the printed circuits. 5 The board arrays are then given a final visual inspection for defects and are sent through the singulation process in which the individual boards are cut from the array and labeled. into the plastic outer housing. The housing also contains the on-off switch, belt fastener clip, and battery compartment with electrical contacts. At this point, the pagers have none of their specific features. They have not been assigned a radio frequency, nor have they been programmed with a unique telephone number or any customer options. All of that will happen in the back end process. 7 First, a crystal is soldered to the receiver board. A crystal is an electronic component which can be activated only by a specific radio frequency. 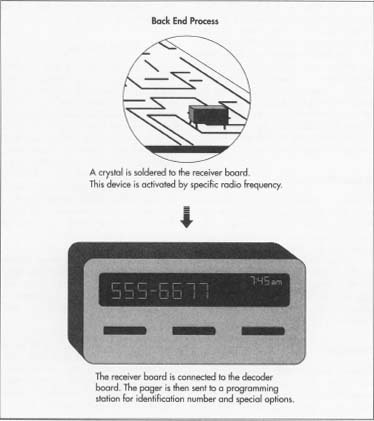 The crystal is selected to match the radio frequency assigned to the pager. 8 The receiver board is then connected to the decoder board inside the pager housing, and the housing is sent through a laser which is programmed to etch the pager identification number and other data onto the back cover of the housing. 9 The pager is sent to the programming station where it is automatically programmed with a unique identification number and a large spectrum of options selected by the customer. 10 The After programming, the pager crystal and filter frequencies are tuned at a manual tuning station. This ensures the pager will receive the exact radio frequency assigned to it and prevents reception of messages intended for other pagers on other frequencies. Sometimes this process is done automatically. 11 In the final assembly station, the back I cover is secured onto the decoder board, a battery is inserted, and the pager is turned on. After passing a radio frequency test and a final visual inspection, the pager is packed and sent to the customer. In addition to the visual inspections and electronic tests, the entire pager manufacturing process is monitored by the CIM system. This system can alert production workers if any component has been inadvertently omitted or if any function has not been programmed into the device. Manufacturers also perform rigorous testing of new designs under extremes of temperature, vibration, and impact. This simulates conditions such as leaving the pager in the sun in a locked car or accidentally dropping the pager on a hard surface. Recent developments in pager technology include the ability to transmit a limited number of pre-programmed responses back from the pager to the caller via radio signals. For example, this would allow the pager user to send a message of "buy" or "sell" in response to an urgent inquiry from his or her stockbroker. Two-way communication via pager is expected to expand in the near future. Another recent development is a pager card which can receive and store a large amount of information. Looking something like a thick credit card, this device signals the user when a message is received. The user then plugs the card into a computer, and the pager displays the message on the screen. Some models have up to 512 kilobytes of memory. Future developments in pagers will result in even greater range, including worldwide paging, and greater information retrieval capabilities. Although basic pagers will probably continue to be popular because of their low price, competing technologies may limit further growth. Cellular telephones and wireless personal digital assistant (PDA) devices, for example, have the capability to transmit voice, fax, and e-mail via radio networks. As the price of these devices and services becomes more competitive, many current pager users may decide to upgrade to obtain the benefits of increased information communication. Lewis, Geoffrey E. Newnes Communications Technology Handbook. Newnes, 1994. Chien, Phillip. "Letter to a Beeper." Popular Mechanics, April 1995, pp. 50-53, 124. Cooke, Jim. "Build the Phone Pager." Popular Electronics, November 1993, pp. 37-40, 94. Henkoff, Ronald. "Keeping Motorola on a Roll." Fortune, April 18, 1994, pp. 67-78. Kantra, Suzanne and Marcelle M. Soviero, eds. "What's New: Omni-Pager." Popular Science, February 1994, p. 12. Kirschner, Suzanne Kantra and Bob Sillery, eds. "What's New: Talking Back." Popular Science, April 1995, p. 12. "What's New: Pen-Size Pager." Popular Science, April 1995, p. 20. Therrien, L. "Pagers Start to Deliver More than Phone Numbers." Business Week, November 15, 1993, p. 180. The Manufacturing Process section of this entry was written with the help of Fred Schmidt at Motorola.